the hopes of those who fled. About the Author: Ruth Bavetta writes at a messy desk overlooking the Pacific Ocean.Her poems have appeared in Rattle, Nimrod, Tar River Review, North American Review and many other journals and anthologies. Her books are Fugitive Pigments (Future Cycle Press, 2013) Embers on the Stairs (Moontide Press, 2014,) Flour Water Salt (Future Cycle Press, 2016.) and No Longer at This Address (Aldritch Books 2017.) She likes the light on November afternoons, the music of Stravinsky, the smell of the ocean. She hates pretense, fundamentalism and sauerkraut. 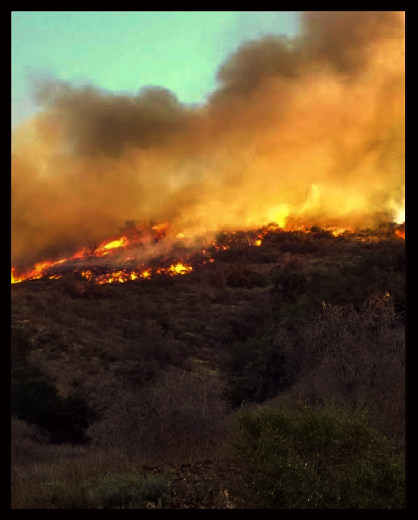 This entry was posted in Ruth Bavetta and tagged American Literature, California wildfires, Poetry, Ruth Bavetta, Simi Valley, Wildfire, Woolsey Fire. Bookmark the permalink. I love the progression from the harm to the natural world to loss of personal possessions. The last two stanzas make this a poem that will stay in memory. I’ll be sharing this, Ruth. I love sauerkraut, but we agree on most things.